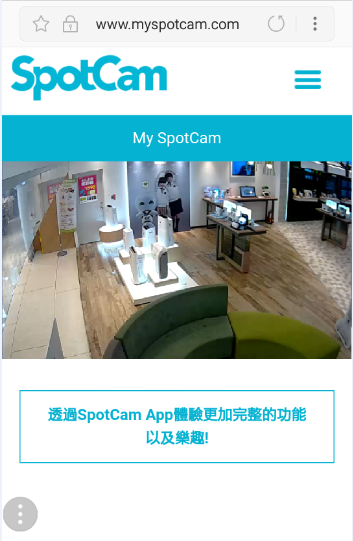 You can share SpotCam video with your friends and families or publish your video on our web site following few simple steps in SpotCam setting page or SpotCam mobile App. You can send an invitation to your friends or family member's email address to share your video with them. Below is a step by step instructions to show you how. Note here we use web browser for illustration, you can also do this with your SpotCam App on mobile too. 1. 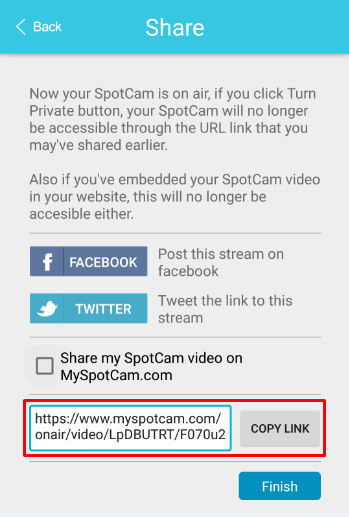 Open SpotCam setting page and click “Share” tab. 2. Enter the email address and invitation message then click “Send your iInvitation”. 3. 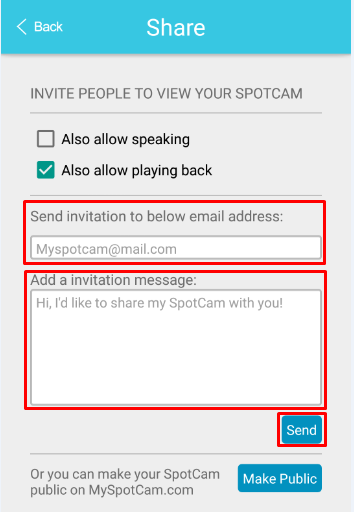 An invitation will then be sent to the mail address you designated, and recipient should click “Check it out” to open the link of shared video and then login with SpotCam account to accept it. 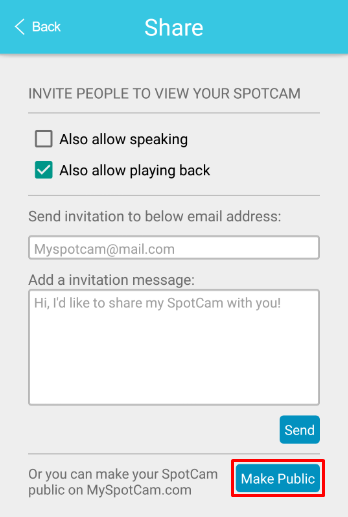 Note the SpotCam account that recipient uses to log in should be identical with the mail where invitation has been sent, or the invitation will not be successful. If recipient doesn't have an account already, please click sign up to register an account with the mail where invitation has been sent after click "Check it out". 1. Open SpotCam setting page then click “Public” tab. 2. 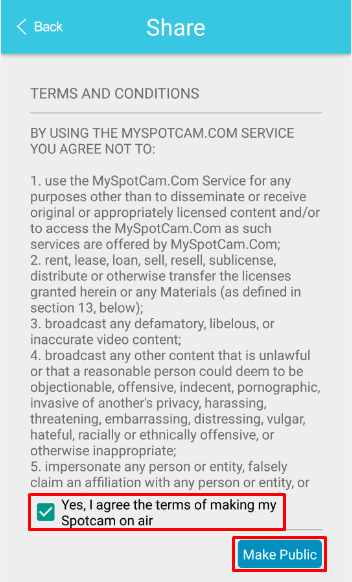 Agree to terms and conditions, tick the check box if you agree, then you can public your video. 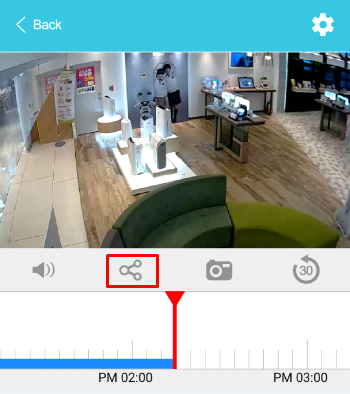 Note your SpotCam video will be public to everyone once you click the button. 3. 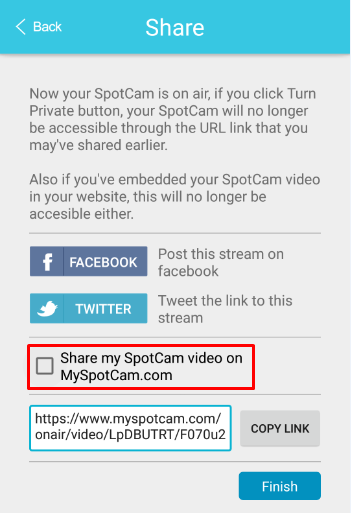 Please uncheck “Share my SpotCam video on MySpotCam.com” if you don’t want to put your video in “Now On Air” section on our web site. 5. Use this code to embed your video into other web site.